Achieve the optimum cost effective and secure wrap every time with an automatic pallet wrap machine. 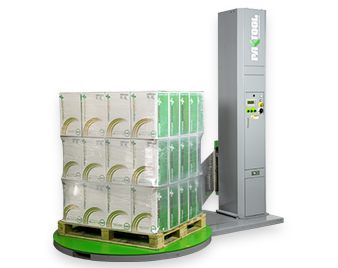 Durable and reliable, the new range of Paktool Stretch Wrapping machines produce a consistent wrap every time and offer a real opportunity* to introduce automation and efficiencies into any pallet wrapping operation. Features include a 1650mm diameter turntable, adjustable turntable speed, adjustable film carriage speed, soft start and stop, programmable wrap cycles, Password protect, Photocell eye height detection. Available in manual film tension control, electromagnetic film tension control and power pre-stretch tension regulation variations.